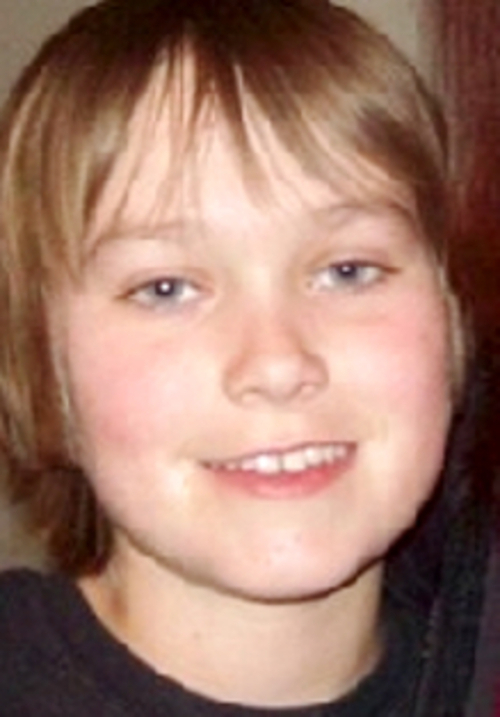 Family • 12-year-old boy's stepfather says search has yielded new information. 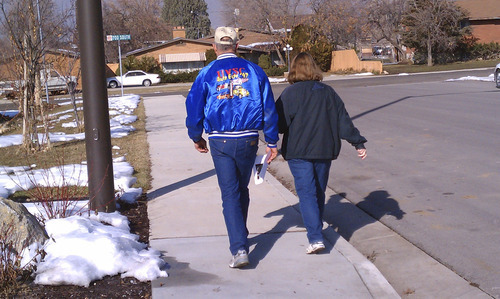 Cimaron Neugebauer | The Salt Lake Tribune Nate Johnson, a volunteer, walks with his wife, Donna, in a neighborhood in Springville to talk to people about missing boy Chad Stilson on Saturday. More than 250 volunteers canvassed the neighborhood and distributed flyers to raise awareness of the 12-year-old boy. 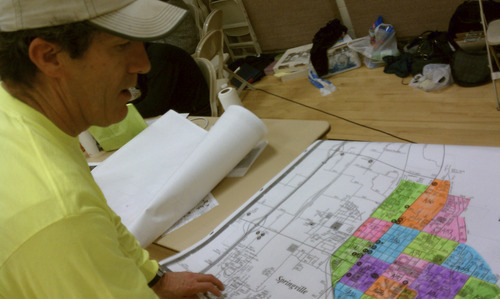 Cimaron Neugebauer | The Salt Lake Tribune Kevin Bardsley, director of the Garrett Bardsley Foundation, shows areas on a map where volunteers are canvassing the area in search of Chad Stilson, who has been missing since Jan. 22. Chad Stilson, 12, walked into his Springville home Monday Morning. His father said the family will talk to the boy after the youngster gets rested. Cimaron Neugebauer | The Salt Lake Tribune Nate Johnson, a volunteer, talks Saturday to a woman in the neighborhood about Chad Stilson, who has been missing since Jan. 22. More than 250 volunteers canvassed the neighborhood and distributed fliers to raise awareness of the 12-year-old boy. Springville • More than 250 volunteers in Springville canvassed neighborhoods Saturday with nearly 7,000 fliers in an attempt to bring Chad Stilson home. The 12-year-old Springville boy left his home Jan. 22, shortly after being told he was grounded. On Saturday, the Garrett Bardsley Foundation teamed with the Stilson family to help increase awareness of the missing boy, and to search for him. "We have got to find him. It has been over a week now," said Kevin Bardsley, director of the Garrett Bardsley Foundation. The organization searches for lost and missing people. For Bardsley, the search for a missing boy hits close to home. His son was lost six years ago when the family was camping in the high Uintas. The 12-year-old has never been found. "We don't want the family to go through this," Bardsley said. "That is why we are attached to [the search]. That is why we are here to help." Volunteers knocked on doors Saturday in the area where Stilson was last seen to ask if anyone had seen him, Bardsley said. They advised residents to look in sheds, campers and other places where the boy may have sought shelter from the cold. The efforts helped, said Chad's stepfather, Dennis Stilson. "We have got a lot [of information] today," he said. "We have new information about other people and older kids that might be involved." Stilson did not elaborate. Bardsley said new information gained from volunteers was not "concrete," but was passed on to police. The family also learned of another phone call that was made from the boy's phone last Thursday, he said. Chad's mother, Vicki McGarry, said it has been "like hell" for the past week as she searched for her son. "I cry a lot and I sleep with his clothes, because they smell like him," she said. She has no clue where her son would have gone, she said. Her son wasn't very social and only had a few places he would go  home, school or his friend's house, she said. A girl who is good friends with Chad said he stopped by her house the day he was reported missing. They exchanged text messages that afternoon, she said, and she received a call from Chad's cell phone number Monday night. Stilson's great-aunt, Donna Johnson, joined a group of volunteers at 9:30 a.m., and was still handing out fliers in the afternoon. 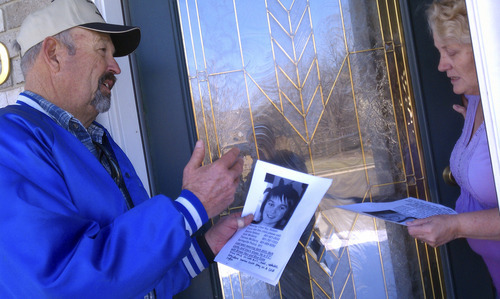 No residents mentioned ever seeing Chad, and some were unaware he was missing, Johnson said as she walked down a sidewalk of a subdivision in Springville with a stack of fliers in her hand. She said she feels "scared" thinking about what might have happened to Chad as the days go by.